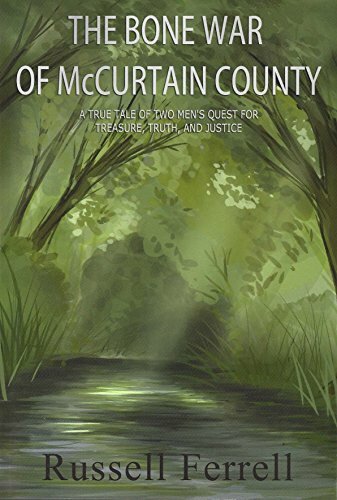 Article first published as Book Review: ‘The Bone War of McCurtain County’ by Russell Ferrell on Blogcritics. “The Bone War of McCurtain County” by Russell Ferrell is a true story about two backwoods naturalists who discovered a world-class dinosaur specimen in the 1980s. The story is not only a very informative read, it also provides significant facts on dinosaur bones and how this book came into being. Ferrell provides a very detailed prologue on how he came to meet Cephis Hall, and why he chose to write about the history and the people of Arkansas and Oklahoma. Cephis Hall and Sid Love were born naturalists who loved to explore and increase their knowledge of crystals and fossils. On the journey with these two down-to-earth men, readers will experience many emotions as they discover one of the biggest finds of dinosaur bones in history, and their fight with those who want to take this history away from them. Typically, many large corporations ignore those “little people” until they find that they have something of value. I found the background on the term “hillbilly” to be very interesting and how, like today, there is a particular class of people who think they are better than everyone else. Through Ferrell's descriptions, readers will see that these "hillbillies" were family-oriented, dedicated, honest and God-fearing people. They worked hard for what little they had, often having to relocate thousands of miles just to feed their families. The author does an excellent job of presenting historical facts, portraying in full-color Hall and Love, and describing corporate America’s need to control everything. It was inspiring to read how these two men held tight to their beliefs and work ethics, and went head-to-head with large corporations to save what was rightfully theirs. The only downside to this read is that the extensive historical background sometimes detracted from the two heroes of the story and the challenges they experienced. That said however, I do believe the history was absolutely relevant to the story. “The Bone War of McCurtain County” by Russell Ferrell is a creative, engaging, and informative read. Ferrell’s writing is well researched, and readers will feel his great passion for Hall and Love as he tells their story and honors their place in history.